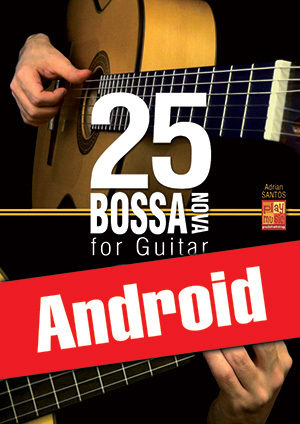 25 Bossa Nova for Guitar (Android) (GUITAR, Courses for Android, Adrian Santos). As it is the most commonly used instrument in Bossa Nova, the guitar stands at the very core of these 25 complete accompaniments; they are performed in the style of legendary Bossa Nova guitar players such as Gilberto Gil, Stan Getz, Joao Gilberto, Baden Powell, Antonio Carlos Jobim and many more. Wistfully swaying rhythms and subtle chords are adorning the pages of this coursebook – admittedly, intended for learning purposes, yet, without ever disregarding the pleasure of playing. The approach to be followed for the interpretation of these 25 musical pieces is illustrated in detail within the three preliminary chapters of this coursebook: fingerstyle techniques, rhythms and chords specific to Bossa Nova are accurately and meticulously explained to you. In addition to this, the DVD shows you all 25 musical pieces at their full length and at two different tempi: first, for demonstration purposes, recorded at actual playing speed, then at a slower speed, in order to give you the opportunity to practice and overcome the upcoming difficulties. For its part, the MP3 CD allows you to practice the musical pieces by playing them along to backing tracks of a proper length – once again at two different tempi: at a slower speed for practicing and at actual speed for playing contextually appropriately.